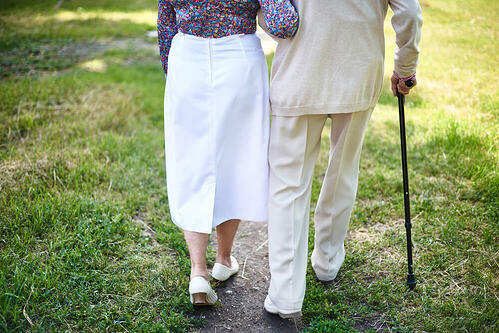 There are many reasons that seniors are at an elevated risk of falling at home, increasing the need for fall prevention. For one, many seniors find their joints are weaker or that they cannot see as well. Certain medications that are commonly prescribed to aging adults can also increase the risk of falling. For example, nonsteroidal anti-inflammatory drugs (NSAIDs), benzodiazepines, anticholinergics, and opioids are linked to fall risk. Falls can lead to injury, including serious damage that causes long-term health issues. Fall prevention for your loved one living at home is an important issue to consider. Luckily, there are home modifications that you can make to reduce this risk. Improving the lighting in your loved one’s home can help them to see where they are going and what they are doing more easily. This is in turn, will allow your loved one to spot potential risks and more safely ambulate around their domain. By making simple changes like these, you can improve visibility for your loved one and protect them from falls. Unfortunately, many senior falls take place in the privacy of the bathroom, especially around the shower and toilet area. Simple enhancements for these areas might include laying down non-slip mats and installing grab bars. Some seniors also benefit from raised toilet seats. For seniors with more severe mobility issues, it may be wise to install specialized bathtubs or showers. Glass enclosures should be avoided because of the damage they may do to your loved one if broken. Enclosures that include low lips, doors, and even integrated seating can all make bathing safer. Steps and stairs can be especially difficult and risky for seniors, even if they do not primarily use a wheelchair. Ramps are often safer and easier to navigate. Many people hire contractors to build full ramps outside of the home for safe access. Contractors are also sometimes able to install ramps inside the home. Mechanical lifts might also be added to stairwells. Financial assistance and contractors working in public assistance can make the process of reducing stair fall risks more feasible. Having support at a moment’s notice anywhere in the home can make a tremendous difference to seniors at risk of falling. Rails provide this support. Install rails around the home for your loved one’s safety and your family’s peace of mind. Rails should be installed at waist height so that your loved can reach them from the floor if kneeling and can lean for support while upright. There are a variety of kinds of handrails. Some people install them strategically around the home in high-risk areas. Others install a pathway of rails between the areas their loved one frequents at home. Even with home modifications, you may still have concerns about your loved one living at home, especially if they are often at home. Home care can be helpful in assessing home risks and providing regular visitation to your loved one so that they are not alone as often. Having someone regularly checking in can make all the difference in regularly preventing falls. Learn about a free home assessment and caring for your senior loved one when you download this free guide.